I've been trying to lure myself out of my one-track focus on nails. It's...kinda not working. Even in Nichole's makeup discussion group on Facebook, I find myself mostly only piping up when nails are mentioned. Being part of that group hasn't exactly gotten me to wear makeup often, but it has brought me into contact with people who aren't as nail-focused. I used to be way more into makeup than nails, if you can believe it. I know how it feels to be confident in one, but not the other...partly because I've kinda switched over the years. Somewhere along the lines, with a lot of help from the Nail Board and intensive reading of loodieloodieloodie, I got my nails under control, but I can still relate to how overwhelming nail care can look from "outside". Now I enjoy offering advice when I can. Nail care is a massive topic and my head spins a bit even trying to pick a jumping off point. Cuticle care is a foundation, and a crash course in nail anatomy seems like a good next step. If you're setting out to have the best nails you can grow, you might as well know how they grow, right? For our purposes here today, this is a finger...kinda. I'm terrible at drawing, but I figure this is fingery enough for what it needs to do. More specifically, it's supposed to be an index finger. These are top and side views and there's an even worse bottom view coming up. The nail plate is made of about 100 compressed layers of dead cells that come from a living portion beneath. The nail plate itself doesn't actually grow, but is pushed forward at 0.5 to 1 mm per week by the formation of new cells in underlying structures. Because the cells of the nail plate are dead, they don't heal. There are treatments that can help reinforce the connections between the cells, but preventing damage in the first place is the best way to keep them healthy and strong. The nail plate is more permeable by water (in other words, absorbent) than skin. Just like your fingers "prune" in the tub, the nail plate will swell when wet, and it happens more quickly. This can worsen peeling for many people. Clipping and cutting can also twist these layers apart. The entire visible nail surface is the nail plate, but the part that's grown past the underlying skin is called the free edge. On most people the free edge is translucent or even almost opaque, unlike the rest of the nail, which is usually transparent. Water and oils can both cause temporary transparent (clear) patches on some people, but this shouldn't affect nail health. The faint, white-ish "half-moon" you may be able to see on some of your nails is called the lunula. If you can't see the lunula on some (or any) of your nails it's no big deal. Everyone's anatomy is their own and varies from the "textbook normal" to some extent. The lunula is just the name for the boundary with the underlying living portion of the nail. It's almost like a smaller nail underneath the nail plate. Moving on from the visible nail structures to the skin around the nail, we come to the cuticle first. As your nails move forward, a thin layer of skin called the cuticle moves with them. It's as dead as the nail plate it's attached to. Pushing this skin back gently can improve nail health and increase the durability of your nail polish. Read my tutorial here and Nichole's here. Just behind the dead cuticle is the living eponychium. The name eponychium may seem intimidating, but its meaning is simple and kinda cute. It's "over the little claw" in Greek. The eponychium can have a hard surface, but there is living skin just below it. This is why I'm completely against cutting cuticles. It's too easy to mistake the dead cuticle for the live eponychium and risk infection or even permanent damage. All I do to this part is moisturize and massage. The paronychium or lateral nail fold is the skin along either side of the nail plate. In Greek it's "beside the little claw". Cute name, but the paronychium is where hangnails are born. It's there as a shield to keep things from getting underneath your nails, but sometimes a small piece can detach and stick up, causing a hangnail. These need to be removed promptly with clean tools or there's a risk of infection. Treating this area like you treat your cuticles can help reduce hangnails. In some people (I'm one), the paronychium can form a hard lump at either side of the free edge of the nail plate. This can be clipped with extreme caution. Read more about how I treat hangnails and other paronychium issues in this tutorial. Turning the finger over we can see the hyponychium. The hyponychium ("under the little claw") is the skin below the nail that dies and forms a protective wall to keep the outside world from getting under your nails. I had to base this diagram more on Nichole's nails than my own. I'm a former nail biter, so my hyponychium is much further back. Biting causes permanent damage like this for many people, but you can still have healthy nails. 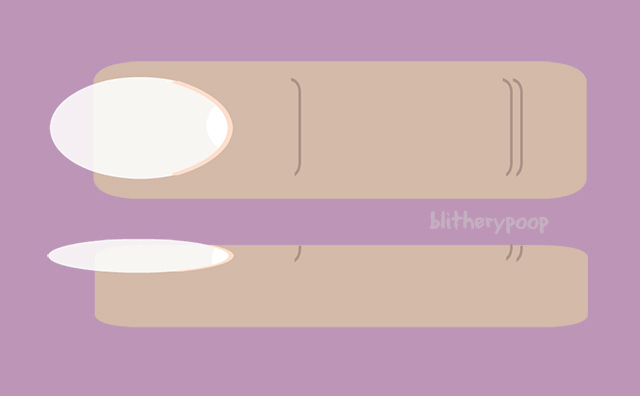 Pushing the hyponychium like you'd push your cuticles is risky and should only be done with extreme caution if it's bleeding or having other issues. It's still not the ideal treatment, even in situations like that. Increased moisturizing and use of cuticle remover are more gentle and don't risk infection. Moving below the visible structures and down into the "guts" of the nail, here's the nail matrix. The red's a little gory looking, but it's appropriate, since the nail matrix is living and receives blood flow. If you have visible lunulae on some or all of your nails, you're seeing the far edge of your nail matrix. That's as much of this structure as you can see, but it extends for a few more millimeters below your skin. This is where new nail cells are grown. As these new cells are set down, they push the older cells forward. The older cells die when they get too far away from the blood supply and they become the nail plate. On a fun little morbid note, the nail matrix is the origin of the myth that your nails keep growing after you die. They don't, but the skin around them dries and shrinks, exposing more new nail plate and matrix and making them look like they've grown. Under the rest of the nail plate is the nail bed. If you've ever gotten a cut or blood blister under your nail, you know how alive the nail bed is. Like the rest of your skin, it's got a blood supply. It secretes oils that keep the nail plate conditioned. Hopefully that made sense! There's more to all of this, of course. I mentioned that we're all at least a little off from "textbook normal" and I think that's what I'll touch on next time. I know I'm not great about replying to comments (I'm still trying to find a workaround to a technical issue), but if you have questions please either leave a comment or ask me on Twitter. Outstanding post and very well-written, clear, enjoyable reading! 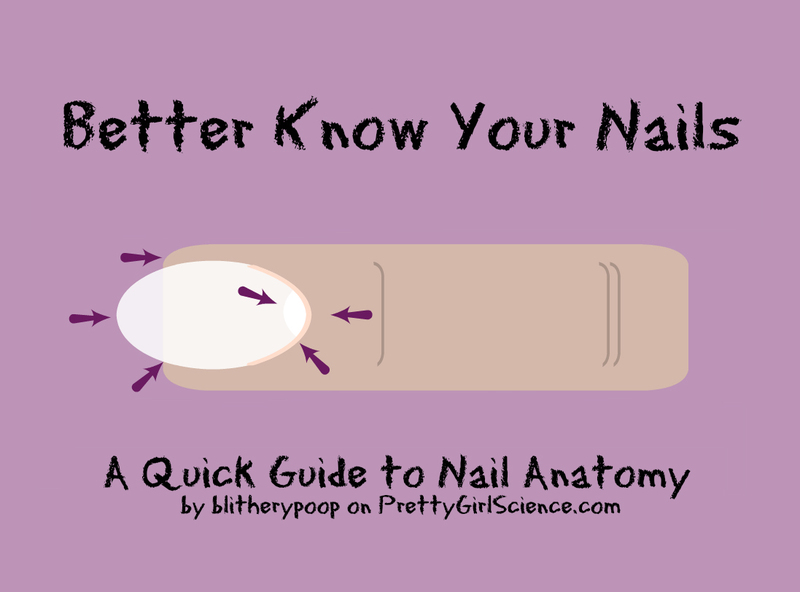 We can never have too many posts about nail anatomy, I think. Love your "fingery" diagrams and the progression from area to area. Like you, I develop hard "shoulders" on my paronychium, so I'll be interested to learn how you deal with this. I too spent many hours reading loodieloodieloodie, especially when I was trying to figure out how to treat my nails better. Something that sticks in my mind from loodieloodieloodie is her description of the hyponichum as "nail meat." *Her hyponichium was particularly well developed. "Don't freak out about my nail meat," she wrote under a photo. *lol* I'll never, ever forget that!